Surface resistivity is another non-destructive geophysical survey method used to investigate subsurface conditions. Surface resistivity can produce a detailed profile of the subsurface even in clay soils. 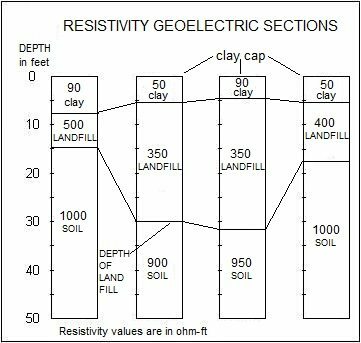 Low ground resistivity is associated with clay soils, moist soils, buried metal, and other conductive materials. High ground resistivity is common in sandy soils, dry soils, and other relatively non-conductive subsurface materials. Application of the surface resistivity method requires that an electrical current be injected into the ground by surface electrodes. The resulting potential field (voltage) is measured at the surface by a voltmeter between electrodes. 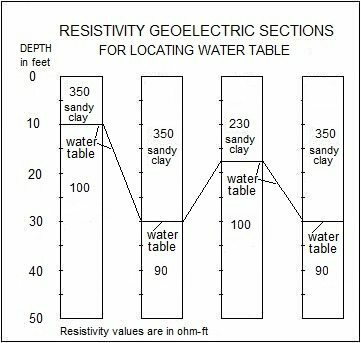 The apparent resistivity of the subsurface materials can be calculated by knowing the electrode spacing, geometry of the electrode positions, applied current, and measured voltage. Surface resistivity measurements are reported in units of ohm-meters or ohm-feet. 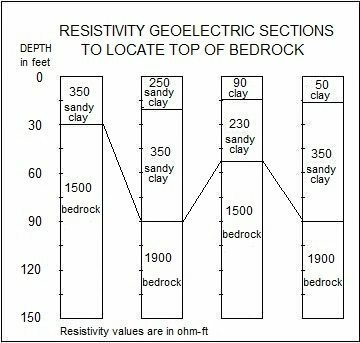 The apparent resistivity values are entered into a computer program that calculates the vertical geoelectric sections or columns for each sounding location. The depth of the resistivity measurement is related to the spacing of the electrodes and may vary depending on the subsurface conditions. 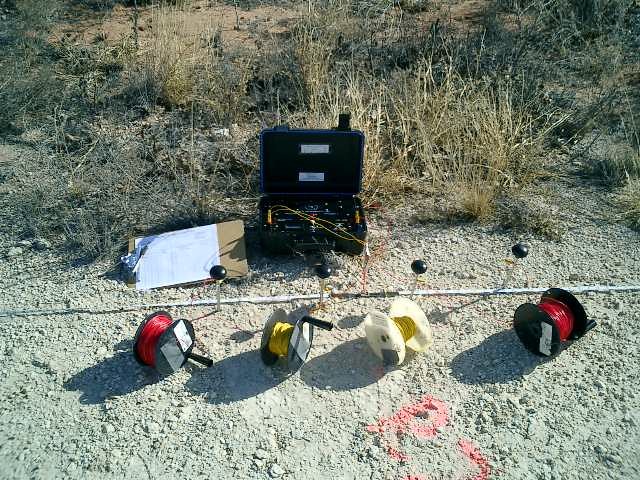 The surface resistivity unit has a self-contained transmitter capable of obtaining data to about 30 meters (100 feet) deep, using self-contained, rechargeable batteries. Surface resistivity measures the electrical resistivity of the subsurface materials, which include soil and groundwater characteristics, from point survey stations at the ground surface. Surface resistivity can be used to study lateral changes and vertical cross sections of the natural hydrogeological setting. Two cross-sectional diagrams of vertical columns of apparent surface resistivity geoelectric sections are shown below. The first shows the results of a surface resistivity survey to locate top of bedrock, and the second shows the geoelectric sections for locating the ground water table. Surface resistivity can also be used to study contamination of soil and groundwater (such as at landfill sites) and to locate buried objects. 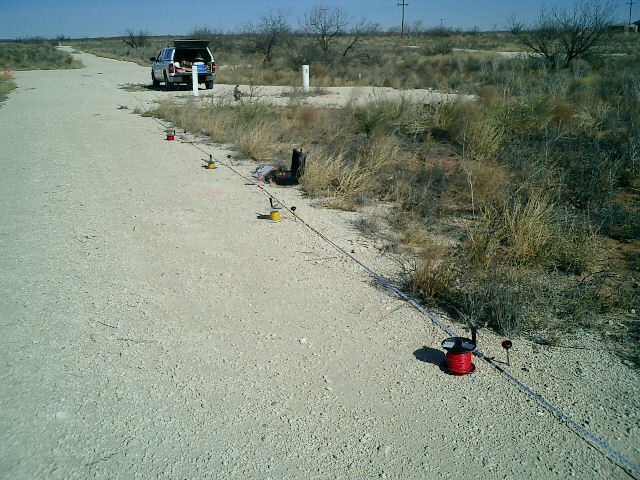 GeoModel, Inc. personnel have conducted numerous surface resistivity surveys and investigations. All surface resistivity surveys are conducted or supervised by registered professional geologists. GeoModel, Inc. can travel nationwide or worldwide to conduct a surface resistivity survey.